Composer John Adams and director Peter Sellars collaborated with notable success on two earlier major "history operas": Nixon in China and The Death of Klinghoffer. Both operas were set to librettos by Alice Goodman, librettos which successfully fleshed out the major roles into rich characterizations, creating sympathetic people with whom an audience could emotionally identify. Doctor Atomic, the much anticipated new work commissioned by San Francisco Opera, was also to have had a libretto by Goodman, but she withdrew, and Sellars took over as writer, abandoning any attempt at original text and instead assembling a pastiche of historical and literary quotations to dramatize the creation of the first atomic bomb. Therein lies the rub. Placed in wartime Los Alamos in 1945, where a huge team of scientists, technicians and support personnel have worked under intense pressure from Washington to develop the bomb, the dramatic arc of the opera, such as it is, is in the tension in the days and moments leading up to the test detonation. 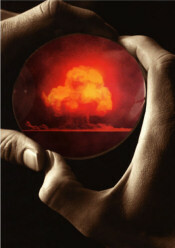 The program was helmed by J. Robert Oppenheimer (Gerald Finley in a powerfully delivered performance), who is determinedly hawkish, while physicists Edward Teller (Richard Paul Fink) and Robert Wilson (Thomas Glenn) have profound reservations about the social and moral implications of using the bomb. The unknown possible effects of the detonation add to the tension–a chorus sings of potential destruction "beyond the wildest nightmares of the imagination." An intimate scene between Oppenheimer and his wife, Kitty (Kristine Jepson), uses love poems of Baudelaire for Oppenheimer and extended, dense poetic text for Kitty, the latter drawn from the poetry of Muriel Rukeyser and expressing a key counter-theme to the impending destructive power: "Love must imagine the world." But the quoted texts distance the characters rather than humanize them; Kitty sings most of her aria standing stage-front, facing the audience, not addressing her husband behind her in bed. In a supporting role, General Leslie Groves (Eric Owens), Army commander of the project is as determined as Oppenheimer to see the test through, even to the point of classical hubris–when inclement weather threatens the delay of the test, Groves says, "I’ll make my own weather predictions." Sellars rather weakly tries to inject some humanity into Groves with details of his dieting. Pasqualita (Beth Clayton), the Oppenheimer’s Native American maid, adds an element of spiritualism and draws the connection between the Indian people who originally populated the desert lands of New Mexico about to be desolated. It all leads up to the inevitable detonation of the bomb, as the cast and chorus prostrate themselves on the raked stage, literally to take shelter from the blast, figuratively paying obeisance to the unknown effects–scientific, political and moral–that they have cooperated in now unleashing. Indeed, a new era begins. Adams’ score, condcuted with conviction and masterful control by Donald Runnicles, provides muscular musical power that propels the work, particularly in the often-Wagnerian grandness of the orchestrations which evoke both the gravity of the themes and the crescendo of tension leading to the detonation. The choruses, too, pack substantial impact. The music for the soloists, however, written sympathetically for the literary content and the patterns of speech, feels more like art song than like opera. When opera is at its most effective, the major characters have been drawn to a depth with which the audience can identify; the characters’ life crises, expressed in the music, find a profound emotional connection with the listener. Because the Doctor Atomic characters are never fully realized, such does not happen in Doctor Atomic, which, while effective in many ways, remains a cerebral experience, leaving the listener far less moved than might be expected from the seminal subject matter. Even Oppenheimer’s stunning first act closer, set to a John Donne poem and sung with intense fervency by Finley, remains more a literary than an emotional experience. Sellars staging is exemplary. With his long term-team of Adrianne Lobel (set designer) and James F. Ingalls (lighting), they have devised a movable forest of vertical and diagonal scaffoldings, horizontal pipe elements. and a simple backdrop which silhouettes the skyline of the Alamagordo test site. The backdrop rises and falls, with brilliantly colored lighting emphasizing the action taking place on stage. Over a substantial part of the proceedings the bomb itself hangs suspended center stage, much of the time directly over the crib of the Oppenheimer baby. The design sense is impeccable, with the shifting elements providing needed visual stimulation, elegant in composition, in what is otherwise a rather static staging. The relatively minor dance elements, choreographed by Lucinda Childs, also add movement, but only in a few moments match the fervency of the drama.